Got a new gadget? Rochester’s industries want to see it. They may even make it and market it for you. THERE’S a man in Rochester, N. Y., whose job it is to help you make a million dollars! His name is Harold S. Rand and he’s the Deputy Commissioner of Commerce for that city. What’s the catch? Naturally, there’s a reason for it—but it’s certainly not a hidden reason. It’s simply part of a scheme to keep Rochester’s industries going at capacity. It all began back in 1946. Rochester’s big factories were still operating at wartime peak but the manufacturers were worried. What was going to happen when government contracts ended? 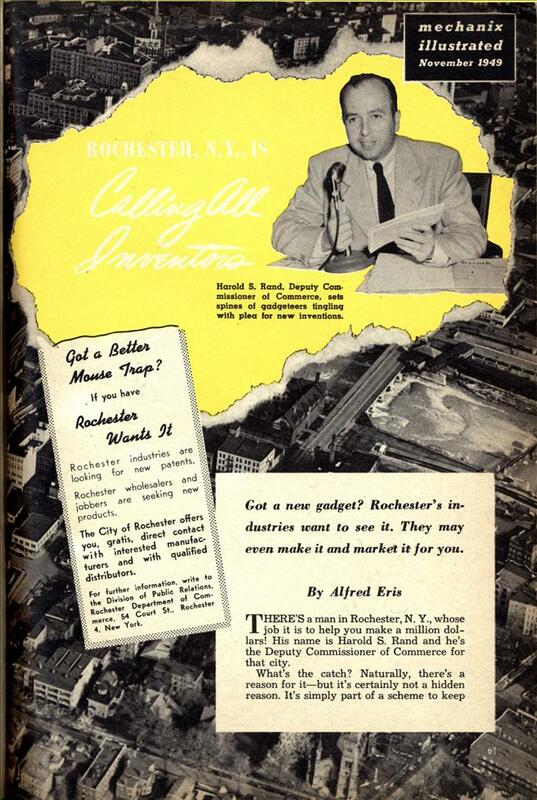 Rochester had always specialized in precision manufacturing and would not be able to meet the demand for consumer goods. How were firms like Eastman Kodak, Graflex, Bausch and Lomb and Stromberg Carlson going to keep their expanded labs and factories going? Someone suggested that inventors throughout America had been working like beavers during the war years on millions of pet projects. The war had prevented the manufacture of these nonessential gadgets. Now was the time to ferret them out and go to work on them! The project was assigned to Harold S. Rand. He worked out ads and began a newspaper, magazine and radio campaign which set the spines of inventors tingling with anticipation. “Got a better mousetrap? If you have, Rochester wants it.” That was the gist of Rand’s appeal to all inventors. And soon, postmen’s shoulders sagged at the mere mention of the Department of Commerce. Inventors from all 48 states, from Hong Kong, Israel, the Philippines, Puerto Rico and India sent in countless suggestions. A Canadian had an idea for a cheap helicopter. A Chinese inventor sent in an excellent suggestion for a television gimmick. Another gadgeteer in Mexico had an idea for a new lunch kit. (It was beautifully designed but too expensive to produce.) Even Mother Necessity helped out. One inventor had his pocket picked by an expert “dip.” Boiling mad, he devised a simple metal frame, with two adjustable claws, which slips into any wallet. You separate the claws and hook them lightly into your pants pocket. Anybody who tries to lift your wallet then will have to take the pocket, suit and you along with it! That gimmick is now being offered to wallet manufacturers and may soon be part of many standard wallets on the market. Frank B. Sweeney, another inventor, developed an automatic throttle control for carburetors—mainly because he suffered nervous strain during a long auto trip. Mr. Sweeney’s foot worked all day on the accelerator and by the time he reached his hotel he had a mental picture of a gimmick which would adjust the carburetor opening to the engine’s power demand and give his foot a rest. Dynaflite, Inc., is selling the latest model of this gadget and Detroit is studying its possibilities for use in its cars. Rand, himself, is partly responsible for one new product which will soon be in millions of American homes. He happened to drop in on Garson Meyer, an Eastman Kodak executive, one day. Meyer was fiddling about with an oversized telephone dial which he was building for his aged mother. Rand saw its possibilities immediately and hounded Meyer until the gimmick was patented. Now, it’s being manufactured by a telephone firm and soon will be available for blind and aged people who have trouble dialing regular phones. A nurse and a traffic control director were discussing fishing one day. Why not use the beaded material laid in strips on roadsigns to reflect light on fish lures, she asked? The result is a fast-selling lure sold by Flectolite, Inc. Success stories like these have gotten to be commonplace in Rochester. Harold Griffin is a local citizen who heard the call for new inventions and went to work in his basement workshop. He developed a pen-like holder for knives. Today, the Griffin Manufacturing Company employs five persons and its holders for crayons and drawing leads are sold throughout the country. Another Rochester man, Paul A. Machines, scored a spectacular success where some of the largest labs in America failed. After two years of hard work, Maclnnes developed a long sought after carbide tool for cutting glass. Today, he makes seven types of tungsten carbide-tipped wheels for some of the greatest companies in the glass industry. One of his tiny wheels cuts from 8000 to 10,000 windshields without being removed from the machine. And speaking of better mousetraps, Rochester has probably found the world’s best. Electronic Traps, Inc., is now selling one which was invented by two telephone company engineers in answer to an SOS from a hotel manager. Working evenings and weekends, the men made more than 80 models over a period of four years. Finally, they came up with a model which has killed 79 rats in a single night’s operation. .
Here’s how it works. The trap is wheeled next to a wall and left to do its work automatically. When a rat runs underneath, it trips a photo-electric cell beam which brings down the trap doors. A light flashes on, disclosing a small open door. Mr. Rat runs for it and then finds himself in the hot seat. Minutes later, his body is thrown out of this electrocution chamber and the apparatus is automatically reset for the next unsuspecting victim. Besides photoelectric cells, the trap has special timers and other precision devices. To perfect it even further, a new model is being built with a spray device to kill the rat’s fleas as well. While Brother Rat’s on the hot seat, another timer operates a mechanism which releases a jet spray of insecticide on the corpse. Another device which will soon be commonplace in America is the Meterad, an invention of two employees of the N. Y. State Department of Labor. These men visualized parking meters as not just mechanical monsters that devour nickels. They saw them as ideal advertising media. They came up with a cast aluminum frame for advertising material which fits on most U. S. parking meters. Meterad space is now being sold through advertising agencies and will be serviced and installed only by the manufacturers. However, don’t get the idea that all inventions sent in are immediately okayed and put into production. The percentage of ideas accepted boils down to a very low figure. Even if as many as ten per cent are worth considering, only about one per cent ever see daylight as finished products for sale on the open market. Sometimes, inventors from widely separated parts of the country send in the same idea. They are usually incredulous when this is pointed out to them. So, if you’re thinking of a new type of sugar dispenser or mulling over a salt-and-pepper shaker that whistles Dixie, better forget about it. So many designs have been received for these types of gadgets that the Department of Commerce has begun to send them right back without submission to the industrialists. However, anything really novel receives thorough consideration. At times, though, negotiations with inventors have broken down because the inventor showed a complete lack of sympathy for the manufacturer’s problems. The small manufacturer, considering a new item, must watch his costs carefully to avoid a fatal plunge into bankruptcy. Most of them are gambling on a 100-1 shot—a best selling gadget which will capture the vast American market. But, most of the time they plod along on an entirely different basis. It’s called the one-shot setup and it works this way. A manufacturer tries to mass produce quickly and capture the market with a new item as rapidly as possible. Inevitably, his competition is going to come up with a lower-priced duplicate, thereby cutting away his market. So, he has to hurry. Sometimes, the inventor doesn’t realize this situation and considers 100,000 produced as 100,000 sold. That, of course, is not the case. And if the manufacturer tries to bring down costs by simplifying some feature of the gimmick, the inventor often shrieks “Murder!” More than one invention has never even reached the market because of the inventor’s refusal to allow production-line changes. Few women suggest gadgets, but a great number of retired mechanics flood Rand’s office with suggestions. Usually, they say: “I’ve been thinking about this idea for years but somehow I never found the time to work it out. Since I retired, etc. . . .” Although most of the gadget ideas have come from mechanics, machinists and other industrial employees, Harold Rand is convinced that 99 per cent of the American people have an inventive streak in them. So, if you’ve got a gadget, tool or invention which you think is needed, all you have to do is drop Rand a line, telling about it. Write to: Harold S. Rand, Department of Commerce, 54 Court Street, Rochester 4, New York. Rand will answer you promptly and let you know if the gimmick you describe has potentialities for Rochester. If it does, he’ll put you in direct contact with interested manufacturers. If they feel your gadget is “it” they’ll make it and market it all over the world. The service costs you nothing at all. And you have the added satisfaction of knowing that your pet idea will be manufactured, by some of America’s best machinists, men who have already established a fine record for Rochester’s industries. Rochester boosted its business, too, when manufacturers in other parts of the country heard about the city’s quest for inventions. They wrote in to ask if local factories could handle sub-contract work of a precision nature and Rand’s answer was yes. This brought in about $3 million worth of work annually. Also, cities like Nashville, Tenn., Worcester, Mass., and Sidney, Mont., are considering launching Rochester Plans of their own. If you still don’t believe that the Rochester plan has really been a success, just watch your local markets. Rochester’s highly skilled technicians will be sending a host of new inventions your way within the year. For instance, Bausch and Lomb will soon put their Allen Goniscope on the market. It’s a tiny device for studying eye diseases, particularly glaucoma. They’ll also market the first variable-power telescopic rifle sights ever made there. The Doyle Company is coming up with two gimmicks for bowling enthusiasts. One is an electronic foul detector for overenthusiastic bowlers and the other is an electric pin-spotter which will cut down low-scoring difficulties. It should also cut down low-scoring excuses, say company officials. Then, there’s the Rapidata Corporation which is introducing a new card-punch machine and a sorting machine, both mere fractions of the size of the apparatus now in use. Leblanc Manufacturing is making a cheese cutter. And, to prove its diverse talents, it’s also manufacturing a dustrap filter for hot air furnaces. Talk-O-Products has an intercom system which is always ready for use, requires no warmup and permits private calls to any of the system’s intercommunicating stations. Rand says that Bilkar Products, another Rochester manufacturer, has a new baby’s bib with a wide pocket held open permanently by a harmless spring device. If baby doesn’t have perfect after-dinner manners, it really won’t matter because the “kangaroo pocket” will catch everything. Stromberg Carlson’s Telephone and Switchboard Division has come up with a gadget that’ll be a real boon to the farmer— and the farmer’s wife. It’s a two-step hook-switch for party lines. You can now listen in on all sorts of private conversations without causing a telltale click. The operator can signal “Fire” by ringing the proper bell and all parties on the line can listen at the same time for specific location and directions. Another Rochester firm, Chieftain Products, has a line of automotive scissor jacks with capacities up to three tons. Crosman Arms Company is introducing a new type of air pistol which depends on a refill cylinder of carbon dioxide for its power. Then, there’s Royal Rochester which plans to feature a new portable electric cocktail mixer. Obviously, there’s no crying need for a gimmick such as this, but it’s all part of the Rochester plan to produce gadgets which make work easier and life pleasanter. I would love to see someone do some research to find out exactly how many of these “Inventors wanted” type schemes actually help/favor the inventor. I believe (perhaps wrongly?) that these types of schemes were/are designed specifically to steal inventions from the inventors and give them pennies in return. So, out of curiosity, does anyone have any historical info on Harold S. Rand? 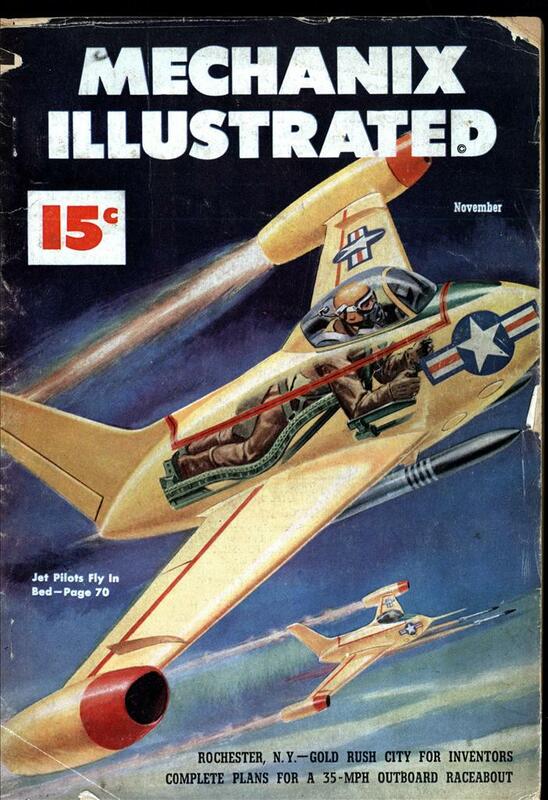 Hey, isn’t that Wonder Woman’s see-through jet on the cover? I would like to speak with a repesentative from your company about manufacturing my product When U Need 2 Go. Terrell Jones: Hold please for the next available representative.